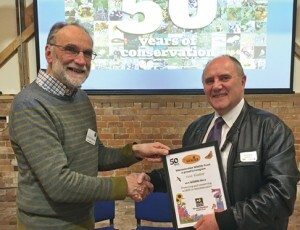 The awards, given by the Worcestershire Wildlife Trust as part of its 50th birthday celebrations, acknowledged the work of 37 people from around the county, all of whom received a framed certificate and a specially-commissioned badge at the awards evening at their WWT headquarters. After several visits to High House Wood, vice-chairman of the Trust Graham Martin (pictured presenting the award to Keith) was suitably impressed by its management to nominate Keith for his part. “It was certainly a real team effort with my fellow members and I’m very pleased to accept the award acknowledging this,” said Keith. “We are indebted to the support given by Lickey & Blackwell Parish Council and all the volunteers who help litter-pick, clean our bench and more. High House Wood holds regular community events , such as a “bat evening” and the planting of a fruit tree to commemorate the 100th anniversary of the Armistice. There have also been two trail wildflower planting initiatives with the aim of reintroducing native flowers.